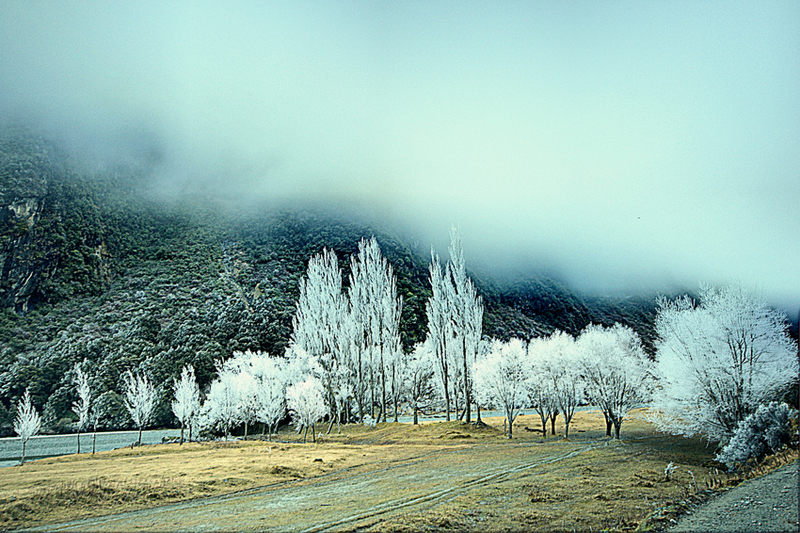 This was shot during the New Zealand Winter early one morning as we were on the long and isolated road to climb Mt. Aspiring. We must have travelled 10 miles, bumping along a single lane dirt road and fording small but deep streams of runoff from the surrounding mountains. The entire valley floor was covered in Hoar Frost – everything had a magical coating of these delicate white crystals. In this image one can also not a blue fog or haze. Interestingly enough, there were blue skies several miles back before we entered this Blue Zone. Very mysterious! Now about this Hoar Frost and its strange name! 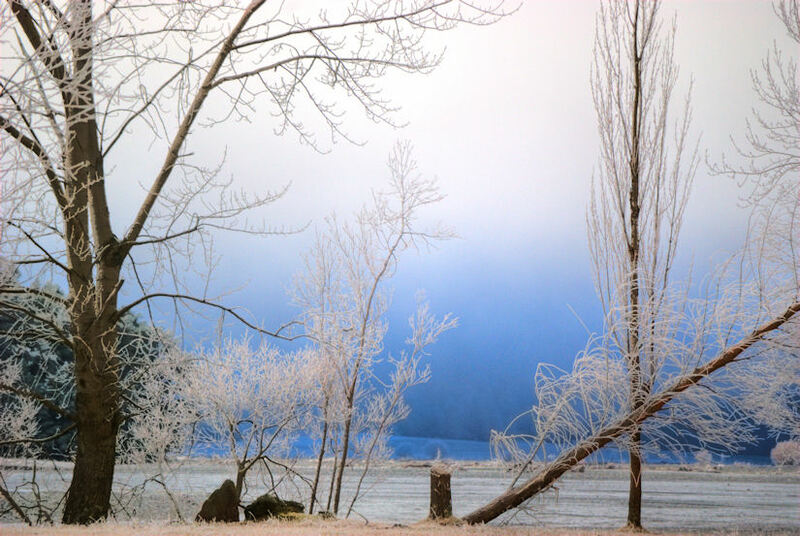 Hoar frost may have different names depending on where it forms. For example, air hoar is a deposit of hoar frost on objects above the surface, such as tree branches, plant stems, wires; surface hoar is formed by fernlike ice crystals directly deposited on snow, ice or already frozen surfaces; crevasse hoar consists of crystals that form in glacial crevasses where water vapour can accumulate under calm weather conditions; depth hoar refers to cup shaped, faceted crystals formed within dry snow, beneath the surface. The name hoar comes from Old English and can be used as an adjective for showing signs of old age in reference to the frost which makes trees and bushes look like elderly white hair. It may also have association with hawthorn when covered in its characteristic white spring blossom. This image was taken on the trek up Mt. Aspiring in July. There was this amazing blue fog enveloping the river valley (I think it was a spectral diffraction as the rest of the sky was clear blue) and Hor Frost covered everything. Makes me wish we had converted our camera to InfraRed capture (coming soon). Getting ready for a trek up Mt. 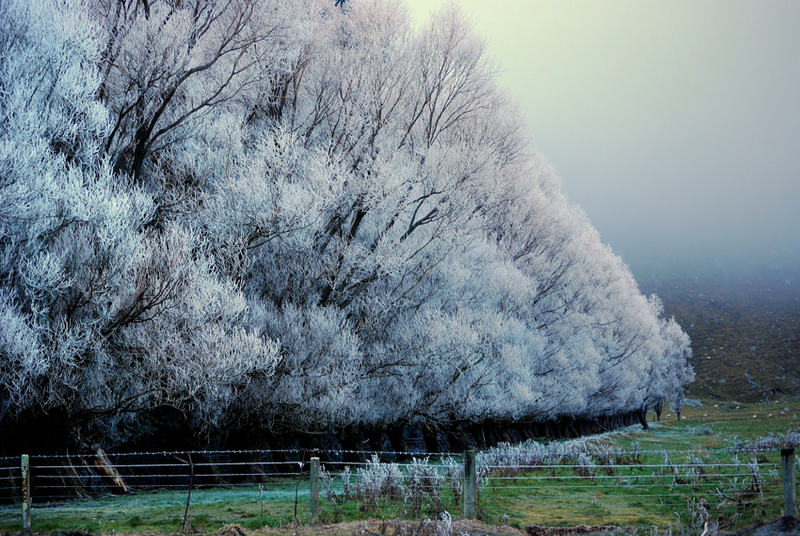 Aspiring, NZ in July, we found the staging area covered in Hor Frost. The entire valley below the mountain was enveloped in a mysterious blue haze making it even more magical. 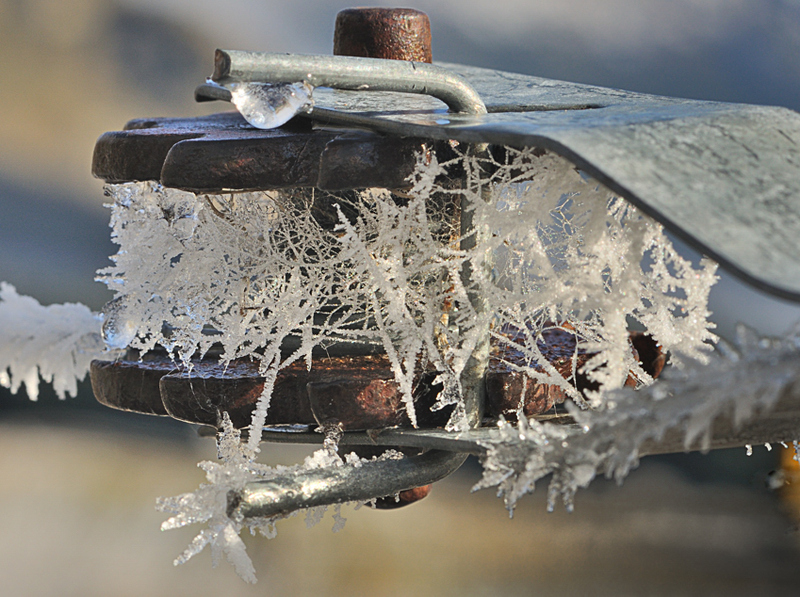 Image is of a turnbuckle in a fenceline – ice spiders at work I guess!